Guardian Gear dogs boots provide dry, long-lasting protection during light outdoor activity. No frosty paws this winter or hot feet in the summer. These all weather dog boots in pink will keep paws dry and safe from snow, ice, salt, stones, heat and abrasive surfaces. These waterproof dog booties have bold, beautiful colors and are made of durable oxford fabric to give pets secure footing and keep them comfortable in cold or hot weather. Dog booties are not suitable for rough terrain. Best suited for soft snow. Available in a set of 4: Guardian Gear dog booties come packed in a clear, snap pouch. Average Customer Review: 4 of 5 Total Reviews: 24 Write a review. They appear to be okay, but having a little trouble putting them on her. She would rather no have them. 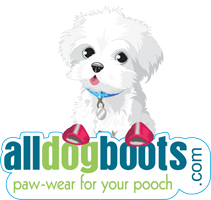 First of all, All Dog Boots has the most amazing service of any company I've worked with. I included a note in my order asking if they could ship the boots ASAP because of a big winter storm we were expecting. I got a shipping confirmation 3 minutes after I placed the order. Truly incredible. The boots themselves are terrible. The paw opening is so tiny it would be a miracle if any dog, no matter how small, could get their paw in there. 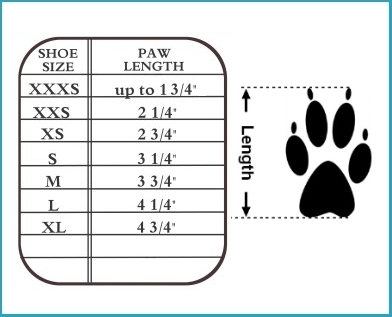 The paw size of the boot is fine, but the entrance is shockingly narrow. I had to cut the seam to get her foot in. They also do not tighten well at all and fall off instantly no matter how tightly I pulled the velco. The bottoms of them are this weird hard plastic, so she slipped and fell right away. Waste of money. Experience working with this store, however, INCREDIBLE. The boots are perfect. I have a tiny poodle and she needed boots for all kinds of weather and these were perfect. We have to get her use to wearing boots!